Recently Prodware attended a day of Microsoft Dynamics 365 partner readiness with Microsoft’s Licensing Expert Trainer, Vicky Lea, and fellow Dynamics Specialists. We covered all aspects of Dynamics 365 pricing and licencing, and customer renewal and transition scenarios. It was a day packed with valuable insight for partners to pass on to our customers and prospects. Let’s look at some of the highlights from the day for if you are new to the Microsoft Dynamics offering. One of the most prominent changes with Dynamics 365 pricing and licencing is that Dynamics 365 is priced via user subscription licenses (USL), in other words, named user licencing (per user per month), there is not the option for concurrent licences with this offering. So what happens if an employee leaves your business who has a named license? And, what about employees who work from the same device? Fear not, licences can be reassigned should an employee leave your business and device licencing is available for several individuals who use the same device. Device licencing can be especially useful for field engineers or warehouse workers who can access a PDA or POS system via a shared login on a particular device. Your options in terms of Dynamics 365 pricing and licencing depend on your individual employee needs, Dynamics 365 has been developed so that the user only pays for what they need using specific role based applications. With this in mind Microsoft offer three licensing types; you can license an individual app as a full user, this then gives you Team Member rights (equivalent to light user rights) to access all the other apps your business uses, you can licence as a Team Member or you can licence using plans. Full details of the rights that are granted with each license type can be found in the pricing and licencing guide. PowerApps and Microsoft Flow capabilities are available within Dynamics 365 so that users can create, modify and use their own mobile apps based on Dynamics 365 data. 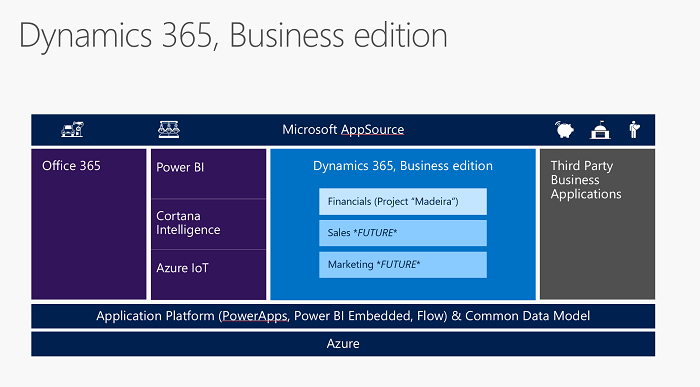 Dynamics 365 Business and Enterprise edition Plans include PowerApps P2, which provides users full “create and run” capabilities across data sources including the ability to model business data in the Common Data Model (CDM). What once were separate business applications have now been built into apps within Microsoft Dynamics 365, including Microsoft Social Engagement, Voice of the Customer, Microsoft Gamification, Mobile Offline, Interactive Service Hub, and Unified Service Desk. 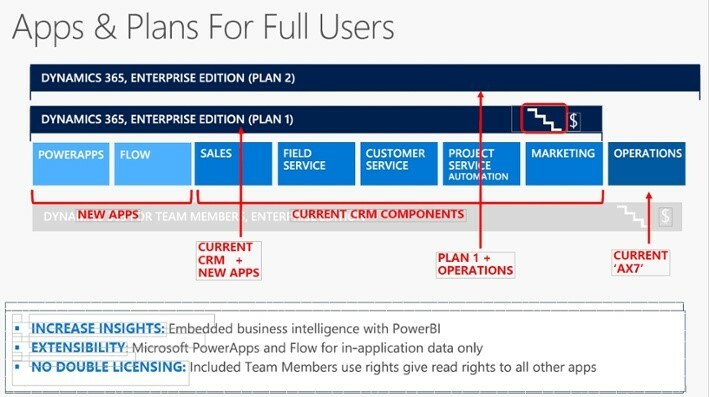 Dynamics 365 for Enterprise is available now, for new customers the minimum user count is 20 for Plan 1 and this increases for Plan 2. , Tiered pricing means it may be more cost effective to purchase plans rather than apps. Plan 1 and Plan 2 seats both count toward Plan 1 tier qualification (including From SA/Add-on SKUs) but the Team Members seats count toward Team Members tiers, pricing updates at renewal. Organisations can reduce or increase users at EA/MPSA anniversaries (not CSP) – and can reduce a plan to zero and start all users at the reduced price tier. Speak with your Microsoft Dynamics partner to find out which way works best for you and your business in terms of getting the most out of the savings you can make with licensing tiers, especially with transition offers for existing Dynamics customers. If you are interested in the Business edition, there are also interim offers for SMBs via CSP only for the enterprise edition, renewable for 3 years and on cloud only before the launch of the Business edition SKU. There will be a transition path for those customers wanting to switch to the Business edition upon its release. We have previously blogged about the functionality included in each Dynamics 365 app and more information can be found here. There is also the ability to extend your functionality with additional add-ons such as storage add-ons, sandbox add-ons or social engagement add-ons. One of the advantages of Microsoft Dynamics 365 for Enterprise is the option to deploy either in Microsoft’s cloud or in a private on-premises or partner-hosted cloud. Dual Use Rights are conveyed through Microsoft Dynamics CRM 2015 and Microsoft Dynamics AX 2012 R3 and later Server licenses, so Dual Use Rights may only be exercised with servers licensed with Microsoft Dynamics CRM 2015 or Microsoft Dynamics AX 2012 or later. However, customers may use downgrade rights to deploy a qualifying server license with an earlier version of Microsoft Dynamics CRM Server and use Dual Use rights to access it with Microsoft Dynamics CRM Online User SLs. Hopefully this blog provides some insight into Dynamics 365 pricing and licencing a more comprehensive document can be found here. In the dynamic world of Microsoft, product change to support modern customer needs are both expected and embraced; so for the very latest updates in regards to Dynamics 365 contact Prodware or visit our dedicated Dynamics 365 website. 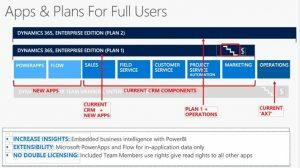 Do you want to try Dynamics 365? You can sign-up for a free 30-day trial of Microsoft Dynamics 365 Plan 1 Business Applications for up to 25 users. At any time during your trial you can activate your subscription and keep your data and customisations. Sign up here and Prodware will activate your free trial. If you are an existing Dynamics customer and want to know about your transition path options contact us.